Here’s another interview with Andrew Gower about playing Winston Smith in 1984 and what tempted him to take on the part. Being Human and Outlander (and their loyal fanbases) get a notable mention, too. You’ve done some beloved dramas, like Being Human and Outlander. What’s the fan response been like? Yes, both Being Human and Outlander are known for their loyal fanbases. The beauty of both of those jobs was that the characters were very removed from me. So I’ve been lucky to get off scot-free, without any strange encounters. The wigs, blood and strange onscreen faces/voices – they haven’t found their way into my day-to-day life. Yet. Theatre.com talked to Andrew Gower about playing the lead in 1984 and his time as Cutler on Being Human. “Making History“, the episode of Being Human that focused on Cutler and Hal’s backstory, has been nominated in the Best TV Episode category in the SFX Awards 2013. You can also vote for Being Human as the Best TV Show, Damien Molony as Best Actor and Sexiest Man, Lenora Crichlow as Best Actress and Sexiest Woman, Aidan Turner as Sexiest Man and Kate Bracken as Sexiest Woman. 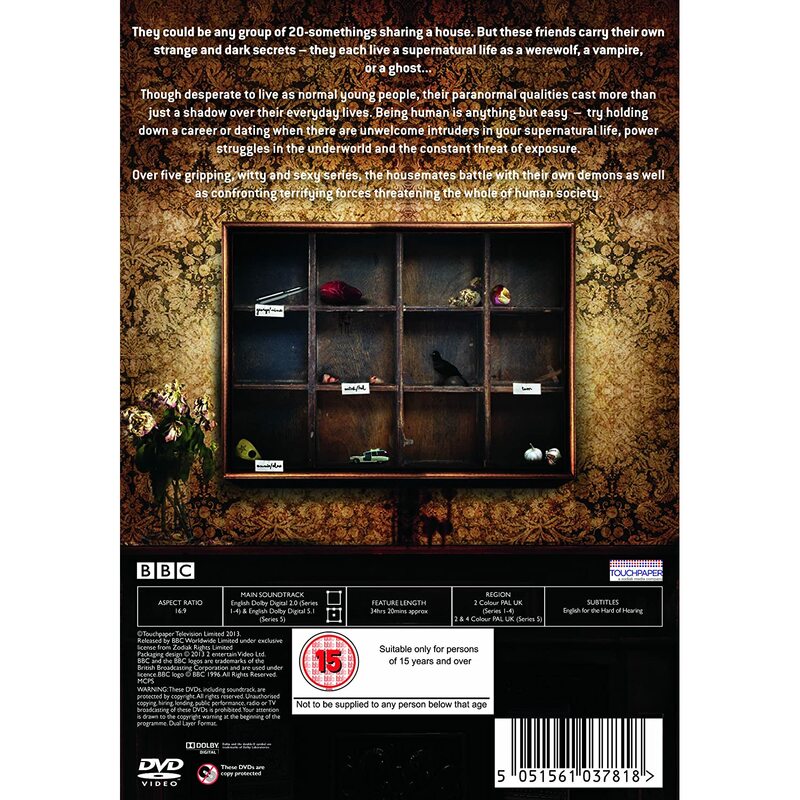 The Being Human – Series 1-5 Boxset DVD box set is now available to pre-order from Amazon. It is released on Monday 8 April 2013. Further details about what will be included on the discs are yet to be confirmed, however we do know that it is a 14 disc set. Andrew appears in series 4 of Being Human as vampire solicitor Nick Cutler. Please note that the following fanfics may contain content that is suitable for adults only, but with that in mind, read and enjoy! The Old Year Passes (part one of the story; links to the following 5 chapters can be found at the end of the chapter); written by non-canonical. On the same LiveJournal there is a wonderful analysis of Nick Cutler’s character, take a look here – it’s pretty long, but needs to be for such a complex character. Hatred is the Madness of the Heart – an amazing 50,000 word fanfic covering the period between Cutler’s recruitment by Hal and Alex’s murder; written by Aquamarine Jo. There are plenty of other Cutler related fan-fictions on FanFiction.net and Archive of our Own – take a look. Keep an eye on his Vimeo page as well as there are also the “Wires” and “Make This Go On Forever” clips from Frankenstein’s Wedding on there – more may be added in the future. You can view Andrew’s Spotlight CV here. The lovely ladies at Omnia, a free online zine, have included an article about Andrew in their latest edition. He’s very unassuming, small and skinny and rather awkward, but he’s an excellent actor, very emotive and funny, and absolutely deserving of everything good that comes his way. You said it Daisy and Nancy! You can read it here. EW.com have published an interview with Being Human executive producer Toby Whithouse about Being Human episode 4×07 “Making History”, a very Cutler-centric episode. There’s also a lovely, spoilery review of the episode on the Independent website, full of gushing praise for Andrew. And another gushing review on Cultfix, this time spoiler free. Entertainment Weekly have posted an interview with Andrew about episode 6 of Being Human season 4 (“Puppy Love“). The interview covers Cutler’s backstory, his last vestiges of humanity and how he based some of Cutler’s mannerisms on Ian Curtis of Joy Division. Cutler likes other people to do the work for him—and manipulation is one of the things he’s very good at. In the last episode of Being Human’s 4th season, the Old Ones, an elite group of extremely powerful, older vampires, have finally arrived in Barry Island. Their leader is Mr Snow (Mark Gatiss), an ancient, over 3000 year old vampire, who is less than impressed by the welcome the only vampire left standing, Cutler (Andrew Gower), can present him with. In flash forwards, we get glimpses of the world, 10 years into the future with “War Child” Eve as a young girl, who is hunted by vampires. In present time, the gang at Honolulu Heights – Hal (Damien Molony), Alex (Kate Bracken), Tom (Michael Socha) and Annie (Lenora Crichlow) – are making plans to stop the Old Ones from taking over the world, when an unexpected visitors comes knocking at their door. Humiliated and disappointed Cutler has had enough of his species and is determined to take his revenge on them. He will do whatever it takes to be remembered in history as the one who ended all vampires and fulfilled the prophecy of the War Child, whose true meaning was revealed to him by Mr Snow himself. In this Cutler (Andrew Gower) centric episode, viewers finally learn about Cutler’s backstory and who his mysterious maker is. In flashbacks we can see a still human Cutler visiting none other than Hal Yorke (Damien Molony) in jail, who has been arrested for “illegal gambling and dog fights”. Hal wants to hire Cutler as his new legal representative and turns him into a vampire. Cutler struggles at first with his new life, finding it particularly hard to kill people, especially his human wife Rachel (Natalie Burt). Cutler’s addiction for blood is overpoweringly strong and so Hal decides it is time to take some drastic measures to show Cutler his old, human life is over and to “burn his bridges”. In present time, Hal pays a visit to the vampires at Stoker’s Warehouse and is surprised to see Cutler there who seems overjoyed that his maker is still alive. When Cutler offers him blood, Hal leaves horrified, but returns later to find out more about Cutler’s plans. This time he accepts Cutler’s offer to earn his trust. The BBC have uploaded an extra scene from Being Human season 4 where Cutler meets Hal for the first time. If you have not yet watched season 4, this contains mild spoilers so watch at your own risk! After Griffin’s “proper death” at the end of episode 1, the vampires are yet again without a leader, and a new supernatural trio – ghost Pearl (Tamla Kari), werewolf Leo (Louis Mahoney) and vampire Hal (Damien Molony) – show up at Honolulu Heights, which causes friction with the current occupants. Cutler continues to work on his plan to reveal the existance of vampires and werewolves to humanity. He has brought a focus group, which appears to consist largely of homeless people, to Stoker’s warehouse and shows them the video of werewolves George and Tom changing at the full moon. Before he can collect their surveys, however, he is distracted by fellow vampire Fergus (Anthony Flanagan) and his “war council” who have a slightly different approach to how things should be handled (and by who) in the future. After the events of the season 3 finale, local vampires have already regrouped around their new leader Griffin (Alex Jennings). They meet up at the warehouse of Stoker Import and Export in Barry Island where they are preparing for the arrival of the “Old Ones”, a group of of extremely powerful elite vampires, who are travelling over the course of a few months across the Atlantic Ocean to Barry Island by freighter to discuss their plans for a global vampire takeover there. Meanwhile the remaining occupants of “Honolulu Heights” – ghost Annie (Lenora Crichlow), werewolf George (Russell Tovey) and his newborn baby – are still recovering from the losses of their lovers, vampire Mitchell (Aidan Turner) and werewolf Nina (Sinead Keenan). Whereas George locks himself up with his young daughter not letting anyone near her, Annie seeks support from young werewolf Tom (Michael Socha) who is desperate to make new friends after his father figure McNair (Robson Green) was killed. Among the newcomers in town is Cutler (Andrew Gower), a young, cocky vampire with ambitious plans to take over the world. While he wants to reveal the existance of vampires as the ones that save humanity from the “bigger threat, the werewolves”, Griffin is looking for an adequate gift to present the Old Ones with. “Vampire recorder” Regus (Mark Williams) seems to have the solution: according to a prophecy, the “War Child” born to two werewolves is the key to the destruction of all vampires – the perfect sacrifice. Cultfix have posted an article about Andrew’s casting as Cutler in Being Human, which returns to BBC Three in 2012. Read it here.